Utterly unique the Wiggly Dog Sculpture will add personality to your style spots! Decorative ornaments, figurines and sculptures helps to make your home feel unique and so it’s important to treasure hunt for pieces that will make you smile. The Wiggly Dog Sculpture will do exactly that! Full of edgy character the Wiggly Dog Sculpture is a unique display piece for your coffee tables, open shelving, console tables, cabinets of curiosities, bedside tables or anywhere in the home that needs a little quirky fun! 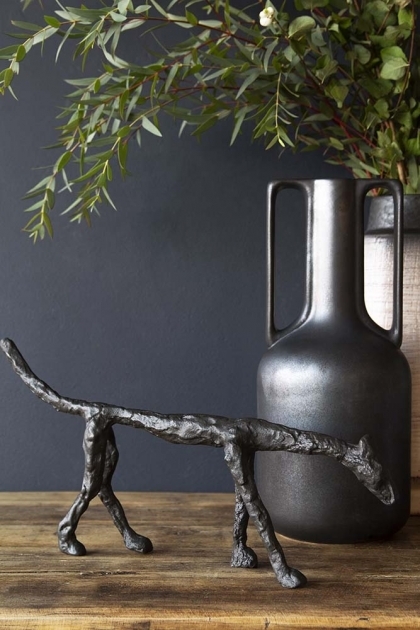 A unique gift idea for your friends, family or yourself the Wiggly Dog Sculpture is a stylish home accessory that you will love.